* A Pool Fence Available on Request. For family with young children, we can arrange supply of a Swimming Pool Fence. Hired & erected for a small fee. * Wifi and Internet TV, Free *A Special Welcome Pack * A service wash available for guest's clothes mid week, no charge * High Chair, Cot, Children's Patio Set etc. available. Free * Gas BBQ and gas bottle * Combined Microwave/Grill/Oven * No Smoking inside the Villa ( There are areas in the garden for secret smokers to be banished to ) *Relaxing Pamper Day Visits, Special Massage, Holistic Therapy, Beauty Treatments, Facials, Manicures & Pedicures, etc, all in the comfort of the villa. Many family & friends enjoy this relaxing addition to their stay. We had a great stay at Casa Albryna. We came here for some relaxing and cycling/running/swimming. 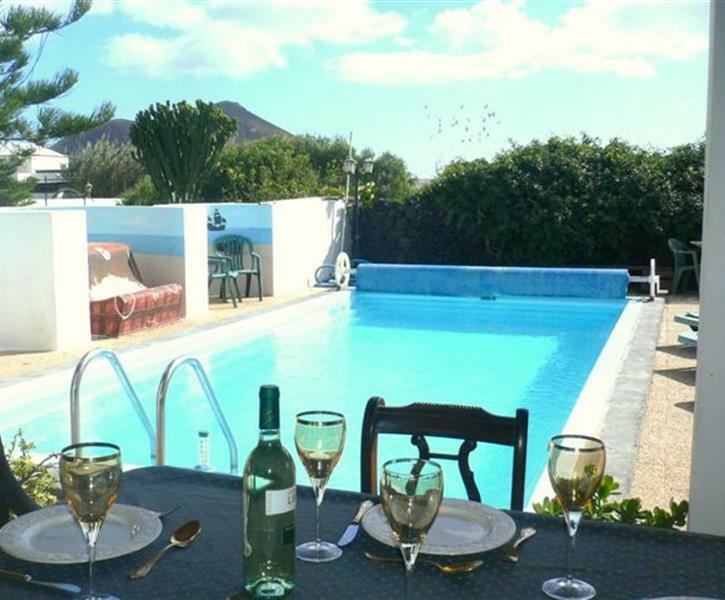 Location is great, close to Tahiche and Teguise with their great bakeries. And we enjoyed the pool very much, water temperature was perfect! I would definitely recommend this appartment. And not to forget, the host, Brynette, was very guest friendly and the welcome package was very helpful. Lovely place everything you need. Clean and tidy. Stayed here for Christmas 2017 and New Year. Cannot highly recommend enough. I felt as if I had arrived home, where home had a beautifully clean, heated pool, absolutely everything I could want for, from clean fresh bed sheets and towels, which were changed more often than expected, all cooking utensils I could need ( love to cook ! ) a superbly large gas bbq, with plenty of gas and an emergency no. To call if another bottle was needed. Rooms were spacious and airy and even thought had been given to supply throws for the lounge and electric heaters for slightly cooler evenings in the winter, welcome pack was personally designed for us ( we are fussy ! ) I had a blonde ( or senior ) moment and messaged owner as I could not find outside light switch for bottom of garden and the response was instant ( felt a bit guilty as it was quite late but we had invited friends who were staying on the island and I wanted them to see the beauty of the villa and it’s outdoor areas). Extras that I found a real home for home were iron and full sized ironing board, not only hair dryer but heated hairbrush and tongues/straighteners...felt v spoilt ! Driving to the villa is SO easy and it is within easy reach of so many places. I could go on for ever praising not only the efficiency and welcome of the owner but also the Villa itself, our friends who visited us called it a ‘little piece of heaven’ and said it was the best part of their holiday spending a day with us there. We felt SO privileged to have stayed at such an amazing holiday spot ! As Schwarzenegger says ‘I’ll be back’ !